COSMODRUM is the Russian term for space station, from the Greek cosmos, meaning order or world, and the Russian drum, meaning road or path. ​This exhibition is part of an anthropological study exploring the meaning of ‘the future’ in the recent (socialist) past of Bulgaria, focusing on the frontier of space and on hopes for interstellar travels. The study deals with the experiences of the Space Age and the Space Race in the Bulgarian context. Entangled in the emotional history of the socialist past, the role of Bulgaria and its experience of space exploration are subjects, which have dominated the cultural life of the country. Since the 60’s, the symbolic presence of Cosmonauts, space jets, and plans for a galactic future have been apparent in political speeches, popular literature, and even in scientific discourses (for example the science of prognostics). With the development of space exploration and the Moon landing, space futurism inspired architecture, fashion, music, cinema and popular culture. In Bulgaria during the 70’s and 80’s, space colonization and stories with aliens are central topic in children’s literature, youth magazines and comic books, and science fiction reached unparalleled popularity with Biblioteka Galaktika (a series of publications of science fiction from around the world). ​Beside popular culture, space futurism is also an important theme in the ideology of the Communist Party, where the bright future was always imminent, and which almost guaranteed the extension of the communist order. The ruling party, however, aimed for the stars but not by words alone: Bulgaria is the only state, which sent two Cosmonauts during the Russian space project INTERCOSMOS. Bulgaria is the sixth nation in the world to send man in space. Further, Bulgaria produces technical equipment for the Russian space program, and manufactures almost half (45%) of all the robots produced in the eastern bloc. Bulgaria was (and is) a space nation! 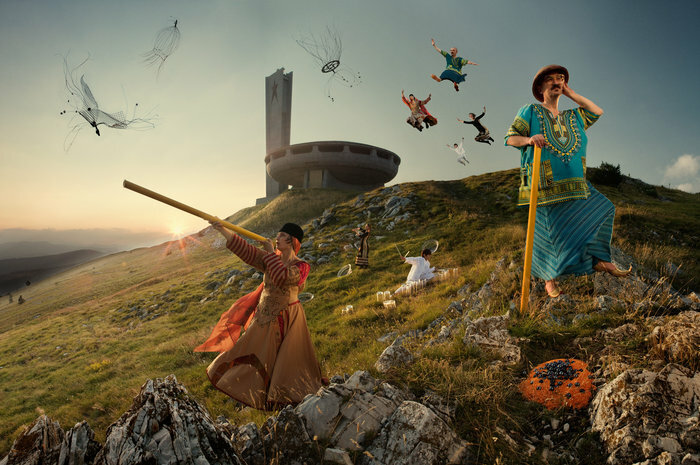 ​Cosmodrum is an attempt to explore the cultural heritage of the space age in Bulgaria. It is an apolitical reading of the “politics of the future” of the past regime. It is a tale of Bulgaria’s space history. Moreover, it is a demonstration of the immense popularity of the future and space in Bulgarian art and culture. We will show you the most famous references to topic of pace in popular culture, as well as in some of the less well-known ones. We are showing a selection of contemporary artist-Cosmonauts: while we might not be in space, but space is already in us. We hope to see you on the Cosmodrum!